Transport packaging is used to ship ingredients, parts and products within a facility or between producers, manufacturers, wholesalers and retailers. Common examples include pallets, cardboard boxes, and plastic stretch film. Most transport packaging has a short life span. Stretch film and cardboard containers typically are used just once, while most pallets are used around 5 times. Most transport packaging is not recycled and still ends up in our landfills. Learn about the latest Reusables trends on our News & Events page. 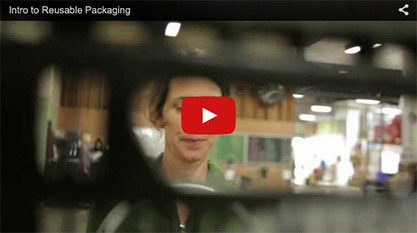 Watch our 3-minute video introduction to reusable transport packaging! Reusable transport packaging replaces limited-use transport packaging with durable alternatives, designed for many years of use.